To protect a young boy, former SEAL Ryker Baptiste faked his own death. He made a promise to the boy’s mother, and he will move heaven and hell—even pretend to be dead—if that’s what it takes to keep the boy safe from his terrorist father. Ryker’s former CIA handler Mia Shaine lost her job because of Ryker. Now she has one chance to stop the terrorist he failed to eliminate and secure her return to the Agency. But it will mean hunting down a dead man and convincing him to once more be her partner. LOVED this book!!! Ryker is a former SEAL hiding a young child to protect him, while the world presumes them both dead. Mia is a disgraced former CIA employee who was terminated over the same op that left Ryker presumed dead. Beatrice has Mia contacted for a specific roll and tasks her with first with finding and recruiting Ryker to be her partner in a specific op. What follows is a quickly moving tale that kept me turning pages just as quickly as possible. Fans of the genre will love this novel and I can't wait to read future releases in this series. The author is on my must read authors' list, and, if you love romantic suspense, should probably be on your must read list as well. 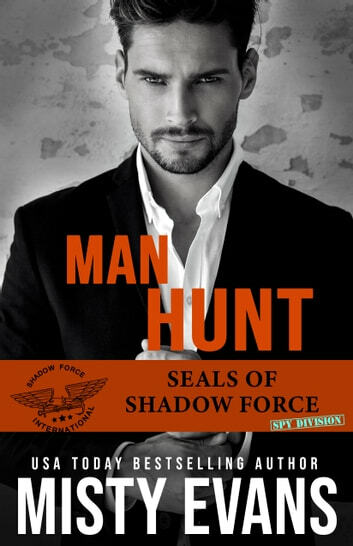 Man Hunt Seals of Shadow Force Spy Division Misty Evans Intriguing suspense, twists and turns, budding romance fills this story from beginning to end. Brought back from the ‘dead’ to finish a mission Ryker is partnered with newbie agent, Mia who has her own agenda to complete the assignment. Can they learn to work together in order to capture the criminal and protect thousands of people? Misty Evans has once again created a story of adventure and romance that will have you not want it to end. SEALs of Shadow Force + spies = YES, PLEASE! Ms. Evans' new series gets off to a great start--it grabbed me from page one and just wouldn't let me go until I'd turned the last page. I loved both Mia and Ryker as characters--throw in the fact that they're spies on an undercover mission, and yeah, I'm pretty much a goner... ;) The action here is non-stop, as is the danger--sure, their romance is more than a little insta-ish (they knew each other briefly in the past, from a distance--Mia was Ryker's handler for the mission that changed both of their lives forever, but they'd never met in person), something the characters themselves actually address at one point. "I've known you forever, at least that's how it feels, and fieldwork counts for weeks, not days. Months, even. Those kinds of situations bring out the best--and worst--of people, and you passed with flying colors." Yeah, that worked for me, too...I felt like I aged a year or two reading this one; it was so edge-of-my-seat stressful! (But in the best way, of course...) This is the first book in her new series, a spin-off of her SEALs of Shadow Force one. Several of that series' characters do make appearances here (Queen B is in charge of this division too) but you don't have to be familiar with them or their books to enjoy this book. If you're new to Ms. Evans, this is a great place to start! Rating: 4 stars / A- I voluntarily reviewed an Advance Reader Copy of this book. Misty Evans is one of the authors I know I can count on for an outstanding read and Man Hunt is a perfect example of the reason. Fast-paced action and a great plot combined with delightful wit and steamy chemistry create the perfect blend for a must read romantic suspense, and that is before we look at the amazing leading characters! Ryker, a covert agent for the CIA who must rise from the dead to protect the little boy who has come to see him as a father, and Mia who put her career on the line for her autistic sister, must work together to protect the things they prize most in the world. This is an addition to the Shadow Force series. We still get to the gang, but a new batch get to work their magic. This one had me hooked right from the beginning. The action and suspense had me on the edge of my seat. Ryker had me won over instantly because watching him with the little boy melted my heart. This book definitely shows you the nasty seedier side of life. I always look forward to Misty Evans books because she may take you on one heck of a ride, but the ending always makes the journey worth it.